The Becton Dickinson Corporation commissioned Michael Singer to create the centerpiece of two interior atrium spaces at the new executive building on their corporate campus in Franklin Lakes. One of the atrium spaces was designed with a sculptural garden, the other with a series of sculptural pieces. Both atria were planned by the architect to be central light wells for the building, providing natural lighting for the core circulation space as well as the adjacent offices and gathering spaces. 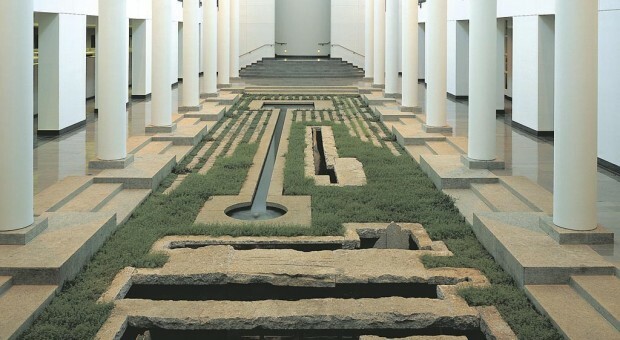 Upon entering the building there is a view of the central Atrium Garden and its linear water element which carries one’s view deeper into the space. Low dense ground cover blankets much of the sculpted ground plane, with several excavated shapes below the surface and around the fountain and water channel. These excavated areas contain different configurations of stone and wood forms. The garden may be viewed from the adjacent dining hall as well as from offices and walkways on the upper levels. The many viewpoints reveal different forms within the underground chambers. In the second atrium, which faces an outdoor courtyard, there is wood and stone sculpture Cloud Hands Ritual Series 1986, an etched copper tablet and an old quarry cart. The elements of the sculpture and etched copper plate reflect the larger forms seen in the sculptural garden atrium. This project won an American Institute of Architects Gold Award.